This species is accepted, and its native range is China (S. Yunnan, Guangdong) to W. & Central Malesia. Herbs, terrestrial, small to robust, to 150cm tall, evergreen or seasonally dormant. Stem rhizomatous, elongate, erect to decumbent, sometimes subtuberous, 8–60 × 2–8cm. 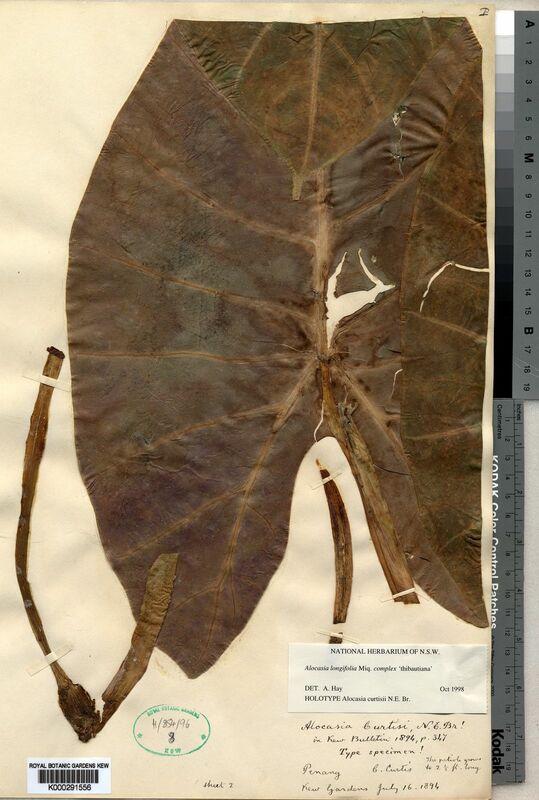 Leaves 1–3 together, subtended by lanceolate papery-membranous cataphylls; petiole terete, 30–120cm, glabrous, sheathing in proximal 1/4, purple-brown to green, strikingly obliquely mottled chocolate-brown; leaf blade pendent, green or flushed with purple abaxially, dark green often with major venation gray-green adaxially, narrowly hastate-sagittate, 27–85 × 14–40cm; posterior lobes peltate for (5–)10–30% of their length, acute, anterior lobe with 4–8 primary lateral veins on each side, axillary glands conspicuous, interprimary collective veins weak. Inflorescences solitary or paired; peduncle 8–18cm, resembling petioles, subtended by cataphylls. Spathe 7–17cm, abruptly constricted 1.5–3.5cm from base; proximal spathe green, ovoid; limb erect, later reflexing, pale green, lanceolate, canoe-shaped, 5.5–7.5cm. Spadix somewhat shorter than spathe, 6–13 cm, stipitate, stipe whitish, conic, ca. 5mm; female zone 1–1.5cm; pistil green, subglobose, 1.5–2mm in diam. ; stigma white, subsessile or on a slender style to ca. 0.5mm, 3- or 4-lobed; sterile zone 7–10mm, narrower than fertile zones; synandrodes mostly rhombic-hexagonal, flat-topped; male zone ivory, sub-cylindric, tapered at base, 1.2–2.5cm × 4.5–8mm; synandria 4–6-merous, ± hexagonal, ca. 2mm in diam. ; appendix pale orange, 3.5–9cm, subcylindric, tapering to a point. Fruiting spathe glossy green, ovoid, 4–7cm. Fruit ripening orange-red, globose-ellipsoid, ca. 1.5 × 0.75cm.